André Dombrowski joined the faculty at Penn in 2008 after teaching modern European art and architecture at Smith College for three years. He received his Ph.D. from UC Berkeley in 2006, and holds an M.A. from the University of Hamburg and another from London’s Courtauld Institute of Art. His research centers on the art and material culture of France, Germany and Britain in the mid to late 19th century, with an emphasis on cross-cultural developments in the histories of science, politics, psychology, and sexuality. 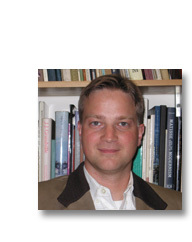 Professor Dombrowski is currently completing a book manuscript entitled Cézanne, Murder and Modern Life, for which he recently won the 2009 Phillips Book Prize from the Center for the Study of Modern Art at The Phillips Collection in Washington, D. C. The book will offer a new approach to Cézanne’s early scenes of murder, sexual violence and anxious domesticity, interpreted through the lens of pre-Freudian definitions of desire and instinctuality. He has started a new project which will focus on Édouard Manet and the Second Empire’s constitutional order. Recently completed essays on Wilhelm Leibl in Paris and Edgar Degas’s Place de la Concorde further his long-standing interest in the cultural competition between France and Germany around the time of the Franco-Prussian War and the Commune. A predoctoral fellow at CASVA, a DAAD fellow, and a recipient of a two-year fellowship from the Gerda Henkel Stiftung in Düsseldorf, Professor Dombrowski was awarded a J. Paul Getty Postdoctoral Fellowship for 2008-9. With Hollis Clayson, he is currently organizing a large-scale state-of-the-field conference on Paris and modern life painting (1863-1886) at the Clark Art Institute for October 2009.